All for 20% off the cost of purchasing them individually. Why were low carb diets created? The purposes of low-carb diets are to lose weight and stabilize blood sugar levels. This is supposedly accomplished through a sharp reduction in carbohydrate consumption, with no limits placed on meats, fats, sodium, or daily caloric consumption. While low carb diets might be able to help you lose weight, they are some of the worst diets when it comes to heart health and meeting your micro-nutrient goals. What will you be craving because of deficiencies? Carbs! Your body is acclimated to getting a lot of those carbohydrates. Far too many, in fact. The sudden drop in carbohydrates will leave you feeling sluggish and low on energy until your cells become accustomed to processing fats and proteins for energy instead. Even if you’re not a big fan of sweets, you’ll find yourself eyeballing candy bars and sugary drinks. Anything that your body knows it can get a quick caloric fix from. What nutrient deficiencies will cause your cravings? Folate. Vitamin B9 (Folate) is the form found in whole foods, while folic acid is the type found in supplements and fortified foods. Folic acid is usually more bioavailable, so the recommended amounts are a little complicated, but the recommendation for adults is 400 mcg. Bonus Products: Multiple, CardioCare, ArgiMax, CardioMax. The reduction in carb-containing foods and concentration on fat and protein heavy foods leaves huge nutritional holes in what your body has to work with. It is vital for those considering a low-carb diet to supplement with a multiple vitamin to fill in the nutritional holes. Heart health can be another major concern for low-carb dieters. While the stabilization of blood sugar levels is great, this diet does nothing for cholesterol levels. In fact, if it has any effect it would be to increase bad cholesterol by failing to regulate trans-fat or saturated fat levels. Supplementing with heart-healthy products CardioCare, CardioMax, and ArgiMax can help offset the harm done by these cholesterol producing fats. As you can see, low carb diets are some of the most nutrient deprived diets on the market. While we here at VitaMist recommend upgrading to a more complete diet, such as The Mediterranean Diet, if you have your heart set on this one, we have your back. 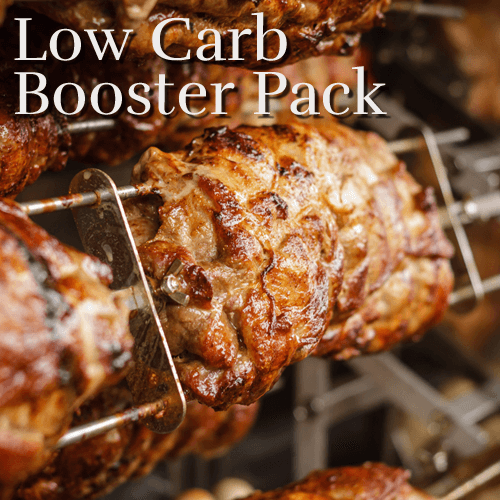 The Low Carb / No Carb Booster Pack is filled with everything you need to get you back up to healthy levels of micronutrients. This pack contains Revitalizer, Folate, Iron, C+Zinc, Osto-CalMag, Vitamin D, E+Selenium and ArgiMax, all for 20% off the cost of purchasing them individually.